Baon is a Filipino word for lunchbox, whether in school or at the work place but mostly pertaining to kids' lunches. I recently resigned from my 9 to 5 job and am currently a stay at home mom/cook/driver. LOL! I'm actually loving it cause I've got more time to cook!!! So lately, I've really been trying to up my game when it comes to preparing Sancho's baon. Last year, I attended the 3rd grade Art Maki class taught by Kumi-San. Kumi-San is a lovely Japanese woman who has a son that is close to my boy's age. With her, I first learned how fun and how perfect art maki was for Sancho's baon. Art Maki is basically sushi rolls that have a fun surprise when you slice them up. They can either have a fun mosaic, a character, a shape or really anything that you can draw inside but with sushi rice and other traditional Japanese ingredients as your medium. It's a fun way to have your protein and carbs incorporated into one bite! 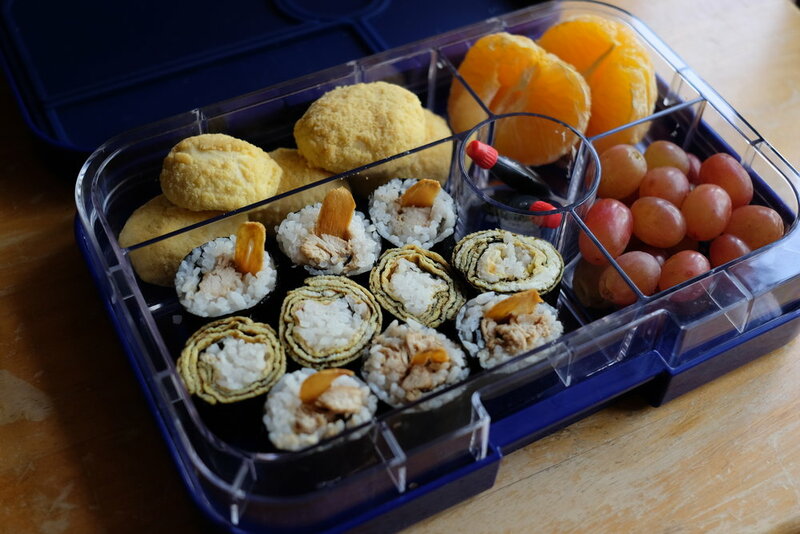 Another factor that inspires Sancho's baon are these cool lunch containers called Yumbox. The Yumbox comes in different colors, sizes and amount of compartments. They are leakproof and you can even interchange the compartments into partitions of four or six, depending on the lunch you want to pack. Personally, I don't like other food to touch each other, I'm very careful about that when I put food in at a buffet. Sounds weird and completely snobby but that's just my preference (#sorrynotsorry). LOL! So when I saw that these boxes were now available in the Philippines, I got so excited and quickly ordered! You can order Yumboxes from Bright Brands PH or you can also find them in the Kids Department of Rustan's Department Store. Sancho loves Japanese cuisine. He really does! I can get away with preparing Katsudon for his baon everyday and he'll be fine with it. However, I want to get other vitamins and nutrients in his body right?? Ugh! Soooo, I've been trying to be more diverse in preparing his baon but I've observed that when I pack him Art Maki, his lunchbox is almost always wiped out! Maybe it's the taste, maybe it's the fact that its easy to pick up in one bite. I really don't know. It's funny though, baon-making once started out as a task but I've found new inspiration. And really, when Sancho goes home with an empty lunchbox and asks me to make more of these creations, it's all the inspiration I need to keep doing what I do. Wash Japanese rice about 8-10 times or until water runs clear. Cook in rice cooker with the 1 cup water. When cooked, let stand for about 10 minutes. Let your rice cool in a bow for another 10 minutes. While cooling the rice, mix together rice vinegar, sugar and salt until sugar has dissolved. Mix vinegar mixture with cooled rice gently and set aside. Beat 2 eggs in a bowl, season with salt and pepper. In a hot non-stick pan, pour a thin layer of beaten eggs and cook. Flip it over when one side has slightly browned. It should resemble a crepe, set aside to cool. Repeat until you have 4 sheets of egg “crepes”. Once you have your sushi rice, egg “crepes” and turkey sausage prepared, place a sheet or nori on a bamboo mat and cover two thirds of one side of your nori seaweed with your sushi rice approximately 1cm high.